bread cutlet - crispy and tasty cutlets made with bread and mixed veggies. these bread tikkis make for a nice evening snack or as an after school snack for kids. firstly boil 3 medium sized potatoes and ⅓ cup green peas in a pressure cooker. take the green peas in a bowl and place in the cooker. just add some water to the bowl containing peas. pressure cook potatoes with enough water just about covering the potatoes for about 3 to 4 whistles or 7 to 8 minutes on medium flame. when the pressure settles down, then open the lid. drain the water and let the potatoes become warm or cool. break 1 slice of bread in pieces and add in a mixer jar. grind to get bread crumbs. keep aside. rinse, peel and then grate 1 small carrot. you can even boil carrot along with potatoes if you want. keep aside. take roughly chopped ½ inch ginger, 2 garlic cloves, 1 green chili (roughly chopped) and 8 to 10 black peppercorns in a mortar-pestle. crush to a coarse paste. peel the potatoes and take in a bowl. also take the steamed green peas. drain potatoes and green peas very well before adding in the bowl. now mash the boiled potatoes and green peas well. add the grated carrots and 2 tablespoons coriander leaves. also add the crushed ginger+garlic+green chili+black pepper paste. add 2 pinches turmeric powder, ¼ teaspoon red chilli powder, ¼ teaspoon garam masala and salt as required. in a plate or bowl take some water and dip 1 bread slice in it. remove and squeeze all the water from the bread very well. do this method with 3 bread slices. the bread slices have to be large and similar to a sandwich bread slice. add the squeezed bread pulp in the bowl containing veggies and spices. mix very well. check the taste and add more salt if required. for a slight tangy taste, you can even add some lemon juice or dry mango powder (amchur). take a portion and shape into a cutlet or patty. in a small plate take 3 to 4 tablespoons of the breadcrumbs. place the bread cutlet on the bread crumbs. coat the cutlet with the bread crumbs. gently press so that the bread crumbs stick to the cutlet. dust off the extra bread crumbs. this way coat all the bread cutlets with bread crumbs. the extra bread crumbs you can keep in a small jar and freeze. heat 2 to 3 tablespoons oil in a tawa or a pan. when the oil becomes medium hot, place the bread cutlets on the tawa. when one side is golden, gently flip and fry the second side. flip again and a couple of times to get an even golden color on the crust. place the bread cutlets on a kitchen paper towels. serve bread cutlets hot with any chutney or dip of your choice. keep the remaining extra bread crumbs in the freezer. pressure cook potatoes with enough water just about covering them. you can use any bread like whole wheat bread or brown bread or white bread. don't deep fry the bread cutlets as they might break while frying. you can add your choice of veggies like beetroot, capsicum, green peas, potatoes, carrots, cauliflower, cabbage, french beans, broccoli etc. 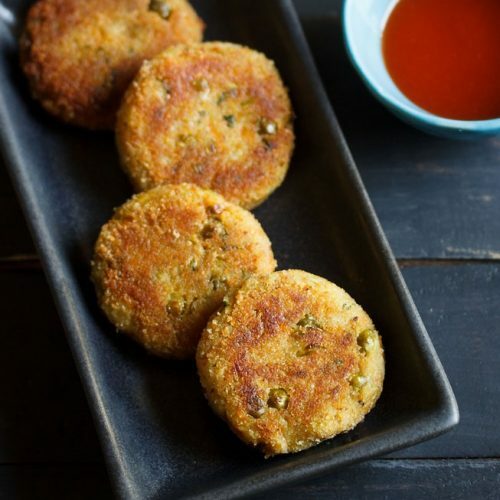 for a no spicy or less spicy version of bread cutlet, reduce or skip the green chili and black peppercorns.